On 1st February, you are performing at the Roundhouse in London with the Ghost Gamelan Orchestra, an ensemble made up of composer Gondrong Gunarto and three other multi-instrumentalists from Java, alongside some of the best musical talents London has to offer. Musicians who have previously collaborated with a number of stars such as Jeff Beck, Sting, and Roxy Music, to name a few. Where does your interest for Gamelan stem from? How are you reinterpreting the genre with your collaborators? I have listened to Gamelan for many years and love, for example, the classic Nonesuch recordings of Javanese court Gamelan. The music is a feast on many levels, sonically, harmonically, rhythmically and also in terms of the atmosphere and ethos it conveys. 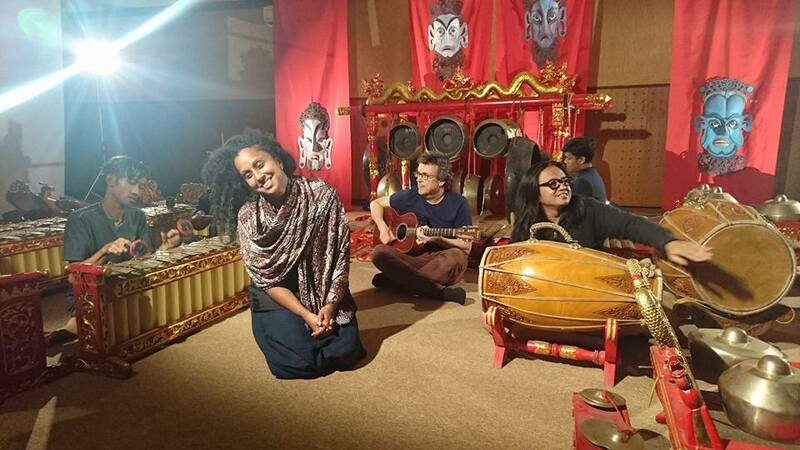 Sam Mills [Ed: her musician/producer husband] and I were travelling in Indonesia in 2015, and were introduced to the amazing Gondrong Gunarto whilst in Surakarta in Java. Gondrong is the son of a Dalang (a shadow puppet master who manipulates and vocalises the puppets) and so is steeped in the culture. Meanwhile, he is known for his work in ‘contemporary Gamelan’ which is sometimes quite experimental and iconoclastic, so there was no problem in doing something a bit adventurous with him. We hit it off right away and decided there and then to do a version ‘Tomorrow Never Knows’, which he arranged in a Javanese style for a group of musicians. We had been planning this as a way to commemorate the 50th anniversary of the Beatles album Revolver. Your new album will be released in 2017 on Naive Records, and it will be indeed called Ghost Gamelan. What can we expect from this work? We loved the sound of the 2015 recording, and had a chance last year to go back and do some more. We had some songs which were not originally written for Gamelan but we knew that Gondrong would find a way to play the songs. We spent a month there rehearsing and then recording. That is the first layer of the record, but we are now adding our own instruments and voices. I think it’s a very exciting sound for us. The challenge is the harmonic juxtaposition of the Gamelan, which has tunings that do not exist in a European or even an Indian context, so seeing how that works is quite fascinating. There are moments of dissonance which actually become quite addictive! Think that consonance and dissonance are part of every kind of music… it’s like matter and anti-matter. This entry was posted in News, Socio-Culture by . Bookmark the permalink.